One of China’s richest men, Jack Ma, is to step down as executive chairman of the Alibaba e-commerce empire on Monday, the New York Times reported. 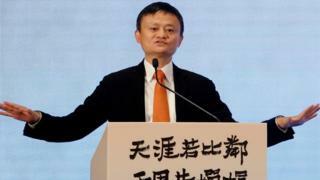 He will remain on Alibaba’s board of directors but focus on philanthropy in education, the newspaper said. Mr Ma co-founded Alibaba in 1999 and has seen it become one of the world’s biggest internet companies. With a market value of more than $400bn (£309bn), it includes online selling, film production and cloud computing. In an interview with the Times, former English teacher Mr Ma said retirement would not be the end of an era but “the beginning of an era”, adding: “I love education”. Mr Ma, who will be 54 on Monday, has a net personal wealth of $40bn, making him the third richest person in China, according to the 2017 Forbes’ China rich list. Earlier this week, Mr Ma told Bloomberg TV that he wanted to create a personal foundation, following in the footsteps of Microsoft’s Bill Gates. “There’s a lot of things I can learn from Bill Gates,” he said. Mr Ma began his professional life teaching English at a university in the Chinese city of Hangzhou, in eastern Zhejiang province. He started Alibaba from his flat in Hangzhou with a group of friends.